We are proud to support Contact Lifeline, the Official Food Vendor for Southern Thunder 2017. They are a 24 hour crisis call center operating in 7 counties. Housed at the Family Counseling Center, they take calls from people that are lonely, depressed, suicidal and angry. Contact Lifeline is a safe place to call with someone ready to listen. They are very patient and allows you to work through your thought process without judgment. This agency saves lives. In fact, this year they have intervened in 59 suicidal calls, helping callers to get much needed help. Contact Lifeline also has a Reassurance Program. They make calls to the elderly, homebound and those living with debilitating depression. Contact Lifeline shows them that they are not forgotten and that someone cares. They are the friend that makes sure that you have eaten, taken your medication, and are in a good place spiritually. Contact Lifeline may be some people's sole source of outside human contact. Contact Lifeline is a 501c3 nonprofit organization and has been in existence for 35 years. Sooooo, stop by their booth! Fill your tummy and quench your thirst while supporting a worthy cause! 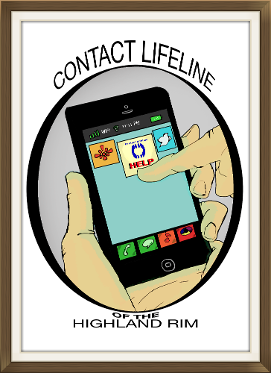 For more information about Contact Lifeline click on their logo above.